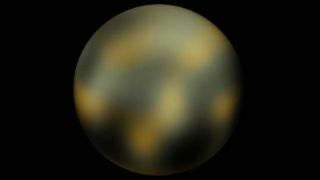 Dwarf planet Pluto is seen in an image taken by the Hubble Space Telescope. The Hubble Space Telescope has spotted new evidence of complex organic molecules — the carbon-containing building blocks of life as we know it — on the frigid surface of Pluto, a new study finds. Hubble observations revealed that some substances on Pluto's surface are absorbing more ultraviolet light than expected. The compounds in question may well be organics, possibly complex hydrocarbons or nitrogen-containing molecules, researchers said. The dwarf planet Pluto is known to harbor ices of methane, carbon monoxide and nitrogen on its surface. The ultraviolet-absorbing chemical species may have been produced when sunlight or super-speedy subatomic particles known as cosmic rays interacted with these ices, researchers said. "This is an exciting finding because complex Plutonian hydrocarbons and other molecules that could be responsible for the ultraviolet spectral features we found with Hubble may, among other things, be responsible for giving Pluto its ruddy color," study leader Alan Stern, of the Southwest Research Institute in Boulder, Colo., said in a statement. Pluto circles the sun in a distant ring of icy bodies known as the Kuiper Belt. Many other Kuiper Belt objects are also quite red, and researchers have previously speculated that organics are responsible for their ruddiness as well. Stern and his colleagues also found that Pluto's ultraviolet spectrum has changed compared to Hubble measurements taken during the 1990s. They used Hubble's powerful Cosmic Origins Spectrograph instrument to make the find. These differences may be related to changes in the dwarf planet's terrain since then, researchers said. It's possible that a steep increase in Pluto's atmospheric pressure has caused changes in Pluto's surface, they added. Overall, the new Hubble observations shed further light on Pluto a few years ahead of the first-ever spacecraft visit to the cold, distant world. "The discovery we made with Hubble reminds us that even more exciting discoveries about Pluto's composition and surface evolution are likely to be in store when NASA's New Horizons spacecraft arrives at Pluto in 2015," Stern said. New Horizons launched in January 2006 on a 4-billion-mile (6.4-billion-kilometer) journey to Pluto. The probe is due to make its closest approach to the dwarf planet on July 14, 2015. On that date, New Horizons will be just 7,767 miles (12,500 km) away from the frigid world.